Blackwater: The Real “Vast Right-Wing Conspiracy”? When Hillary Clinton coined the phrase “vast right-wing conspiracy” during her husband’s presidency, she was referring only to the attacks against her husband—not to a rapidly expanding business of mercenaries and private spies whose largesse is helping fill the coffers of some of the country’s most influential right-wing politicians. But such a phrase comes to mind when one considers Blackwater Worldwide and its founder and CEO, Erik Prince. The company and its leader are tied together in a dizzying mix of right-wing ideologies ranging from privatization and enthusiasm for an unchecked free market, to aggressive nationalistic militarism, the Christian Right, and the broad executive power they rely on for patronage. At the helm of Total Intelligence Solutions are two former CIA heavyweights—Cofer Black, a former counterterrorism specialist, and Robert Richer, a former executive in the CIA’s Directorate of Operations, where he ran clandestine activities in the Middle East and beyond. 3 But the outfit, like all of Blackwater, is under the purview of its secretive founder and head honcho, Prince. Prince was born into right-wing politics with an ideological bent. His father, Edgar Prince, was the head of a Michigan auto-parts company that, after his death in 1996, was sold for more than $1 billion. Edgar Prince, like his son after him, supported a bevy of right-wing causes, bankrolling the nation’s most powerful Christian Right organizations and pouring money into the Republican Party. The hard right surrounded young Prince nearly all his life. The area he grew up in Michigan was known for another massively rich corporate family with a record of funding right-wing causes and candidates: the DeVos family, which made its considerable fortune from its Amway empire (which, despite a Federal Trade Commission ruling stating otherwise, is still called a glorified pyramid scheme by detractors). Edgar Prince, who, according to Religious Right luminary and friend Gary Bauer, committed himself to Jesus Christ after a heart attack in the 1970s, set the standard for right wing philanthropy for the family. 5 Edgar was instrumental in helping Bauer set up the Christian Right think tank and lobby group Family Research Council (FRC). The Princes also have close ties to James Dobson, who was on the founding board of FRC. Dobson, a child psychologist and perhaps the most powerful figure of the Christian Right today, runs Focus on the Family, which has benefited from the Princes’ lavish spending. Even after Edgar’s death in 1995—at his funeral, both Bauer and Dobson eulogized him—the family held tight to the two organizations. Edgar’s wife, Elsa, has served on both boards. She runs (and Erik serves as vice president for) the Edgar and Elsa Prince Foundation, which gave at least $670,000 to FRC and $500,00 to Focus on the Family from 2003 to 2006, according to Salon.com. 6 FRC and Focus on the Family both support President George W. Bush, giving him unmitigated support and receiving high levels of access in return. But businessmen with ties to the GOP and conservative ideologies and pedigrees are not uncommon. What makes Prince special is the confluence of his ideologies in his business—Blackwater. The two most readily discernable right-wing ideologies behind Prince and Blackwater are clearly militarism and privatization; it is, after all, a private military company. As far as privatization goes, Blackwater depends on government outfits like the State Department’s Diplomatic Security Service (DSS) to fall by the wayside so that the North Carolina-based mercenary outfit can pick up State contracts to do DSS’s old job—guard U.S. diplomats abroad. Protecting U.S. interests, notably people in war zones, is how Blackwater built its business. As of late 2007, the company had lost none of its protected charges in either Iraq or Afghanistan, both places where they have a heavy presence (Blackwater’s force in Iraq is two-thirds of what DSS has in total around the globe). 15 But its services have not been without controversy. Last September, Blackwater mercenaries gunned down 17 Iraqi civilians when a Blackwater-protected State convoy ran into traffic at Nisour Square in Baghdad. In a stark and troubling sign of Blackwater’s usurpation of government responsibilities, it was reported that a Blackwater employee was allowed to write the initial State Department report on the incident, which—contradicting later reports, most notably the Iraqi government’s—cited gunfire from the crowd as having set off the melee. 16 An official with knowledge of the investigation subsequently told the New York Times that the incident had been characterized by chaos and confusion, including infighting between Blackwater employees when one of them did not heed a ceasefire call. 17 Though the incident was neither the first nor last of reported Blackwater abuses, it was the first that garnered the attention of Congress. 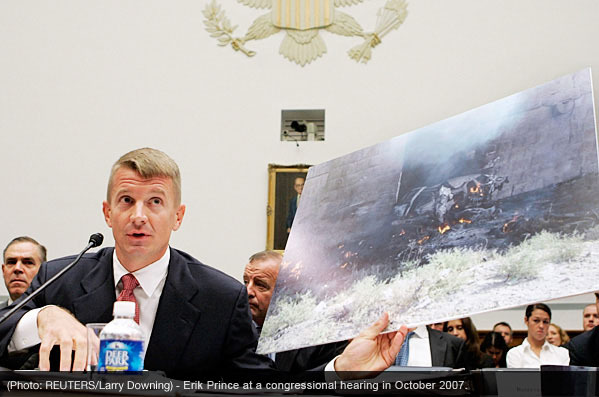 A hearing was called, and Prince, in line with Blackwater’s previous statements, denied any wrongdoing. Absurdly, he even denied that Blackwater had shot and killed innocent civilians. 18 None of the abuses, however, have been prosecuted either in Iraq—where U.S. contractors enjoy immunity—or in the United States. Blackwater’s tentacles into the world of right-wing ideology go well beyond the basics of militarism and privatization. Blackwater’s chief operating officer Joseph Schmitz, for example, was involved in several controversies during his time as inspector general (IG) of the Defense Department. One of them, bizarrely, was his obsession with a Prussian Army officer who was a hero in the American Revolutionary War and whose motto—“Always Under the Protection of the Almighty”—Schmitz spent months working into a new logo for the IG’s office, 21 with questionable disregard for the separation of church and state. Schmitz, as the Pentagon’s IG, was responsible for defense contracts. His watch saw the largest increase in military contracting ever—certainly a boon to Blackwater’s business. But in 2005, Schmitz resigned from the IG under pressure for malfeasance in his oversight—including questionably exonerating Iraq war architect Richard Perle for peddling his influence within the Pentagon. 22 Though he may have lacked oversight, Schmitz was certainly not shortsighted. His Catholicism, ideological politics, and doling out of contracts to Blackwater surely helped his chances of getting a gig with Prince’s outfit, which is where he landed the month after he resigned. But Blackwater is going global in other new and troubling ways. Scahill devotes a whole chapter of his new book to “Blackwater’s Man in Chile.” This is the “real” vast right-wing conspiracy going international. Through extensive interviews with Blackwater’s Latin-American recruiter himself, Scahill documents the relationship between Blackwater and Jose Miguel Pizarro Ovalle, the Chilean responsible for placing nearly 1,000 of his countrymen in Iraq under the employ of Blackwater. Pizarro is a passionate apologist for brutal right-wing Chilean dictator Augusto Pinochet, the general who in 1973 led a CIA-, U.S. government-, and multinational corporation–backed coup d’état to overthrow Chile’s democratically elected socialist president, Salvador Allende. Ali Gharib is a Washington, D.C.-based reporter. He contributes to PRA’s Right Web (http://www.rightweb.irc-online.org/) and is also a writer for the Inter Press Service. 1. Jeremy Scahill, “Blackwater’s Private Spies,” Nation, June 5, 2008. 2. Total Intelligence Solutions, “About Total Intelligence Solutions,” http://www.totalintel.com/dsp_aboutus.php. 3. Jeremy Scahill, “Blackwater’s Private Spies,” Nation, June 5, 2008. 4. Jeremy Scahill, Blackwater: The Rise of the World’s Most Powerful Mercenary Army (New York: Nation Books, 2008), pp. 71. 6. Ben Van Heuvelen, “The Bush Administration’s Ties to Blackwater,” Salon.com, October 2, 2007, http://www.salon.com/news/feature/2007/10/02/blackwater_bush/print.html. 7. Jeremy Scahill, Blackwater: The Rise of the World’s Most Powerful Mercenary Army (New York: Nation Books, 2008), pp. 66.
ince’s Federal Campaign Contribution Report,” Newsmeat.com (as of July 16, 2008), http://newsmeat.com/ceo_political_donations/Erik_Prince.php. 9. Mediamouse.org,Grand Rapids Independent Media, “The Far Right in West Michigan: Freiheit Foundation,” http://www.mediamouse.org/resources/right.php?foundId=9. 10. Grand Rapids Independent Media, “The Far Right in West Michigan: Freiheit Foundation,” http://www.mediamouse.org/resources/right.php?foundId=9. 11. Evan Thomas and Mark Hosenball, “The Man Behind Blackwater,” Newsweek, October 22, 2007, http://www.newsweek.com/id/43361. 12. Letter from Family Research Council president Gary Bauer, April 13, 1995, as cited by Jeremy Scahill, Blackwater: The Rise of the World’s Most Powerful Mercenary Army (New York: Nation Books, 2008), pp. 76. 13. Evan Thomas and Mark Hosenball, “The Man Behind Blackwater,” Newsweek, October 22, 2007, http://www.newsweek.com/id/43361. 14. Evan Thomas and Mark Hosenball, “The Man Behind Blackwater,” Newsweek, October 22, 2007, http://www.newsweek.com/id/43361. 15. Jeremy Scahill, “The War Business is Doing Well,” Star Tribune, June 19, 2008. 16. Jeremy Scahill, “Iraqis Sue Blackwater for Baghdad Killings,” Nation, October 11, 2007. 17. James Glanz and Sabrina Tavernise, “Blackwater Shooting Scence Was Chaotic,” The New York Times, September 28, 2007. 18. U.S. Congress, House of Representatives, Committee on Oversight and Government Reform, Chairman Henry Waxman (D-CA), “Hearing on Private Security Contracting in Iraq and Afghanistan,” October 2, 2007, pp. 86 of transcript at http://oversight.house.gov/documents/20071127131151.pdf. 19. Patrick Cockburn, “Security Firms Lose Immunity In Iraq Deal,” The Independent, July 10, 2008. 20. Madhavi Bhasin, “Maliki and the Timetable: It’s All About Blackwater,” Informed Comment, July 11, 2008, http://www.juancole.com/2008/07/bhasin-maliki-and-timetable-its-all.html. 21. T. Christian Miller, “The Scrutinizer Finds Himself Under Scrutiny,” Los Angeles Times, September 25, 2005. 22. Jeremy Scahill, Blackwater: The Rise of the World’s Most Powerful Mercenary Army (New York: Nation Books, 2008), pp. 365 – 388. 23. Dana Priest, “Wrongful Imprisonment: Anatomy of a CIA Mistake,” The Washington Post, December 4, 2005. 24. Dana Priest and Barton Gellman, “U.S. Decries Abuse but Defends Interrogations,” The Washington Post, December 26, 2002. 25. Evan Thomas and Mark Hosenball, “The Man Behind Blackwater,” Newsweek, October 22, 2007, http://www.newsweek.com/id/43361. 27. Jeremy Scahill, Blackwater: The Rise of the World’s Most Powerful Mercenary Army (New York: Nation Books, 2008), pp. 59. 28. Bill Sizemore, “Blackwater, Prince Looking Ahead After Media Blitz,” The Virginian-Pilot, October 19, 2007. 29. Corey Flintoff, “Blackwater’s Prince Has GOP, Christian Group Ties,” National Public Radio, September 25, 2007, http://www.npr.org/templates/story/story.php?storyId=14659780. 30. Evan Thomas and Mark Hosenball, “The Man Behind Blackwater,” Newsweek, October 22, 2007, http://www.newsweek.com/id/43361. 31. U.S. Congress, House of Representatives, Committee on Oversight and Government Reform, Chairman Henry Waxman (D-CA), “Hearing on Private Security Contracting in Iraq and Afghanistan,” October 2, 2007, pp. 134 of transcript at http://oversight.house.gov/documents/20071127131151.pdf. 32. Mike Nizza, “Blackwater Chief’s Testimony, Minute-by-Minute,” The Lede (blog), The New York Times, October 2, 2007, see http://thelede.blogs.nytimes.com/2007/10/02/watching-the-blackwater-hearing/. 33. Jeremy Scahill, Blackwater: The Rise of the World’s Most Powerful Mercenary Army (New York: Nation Books, 2008), pp. 60.